Intramuscular Stimulation (Gunn IMS) is a needling technique used to treat chronic pain which is found to be of neuropathic origin, and that has not responded to conventional physiotherapy techniques. When chronic musculoskeletal pain persists with no obvious injury or inflammation, neuropathy ("sick nerves") is suspected. Accompanying neuropathy is muscle shortening, causing pain in muscle, tendons, their connective tissue attachments and joints. IMS has shown to be effective in the release of muscle shortening, thus relieving pain. Difference between acupuncture and IMS? 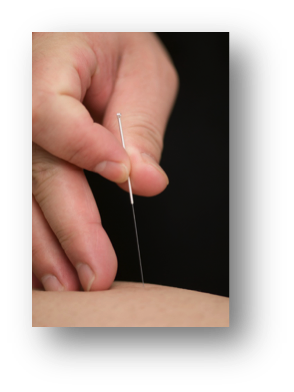 IMS uses needling technique as does acupuncture' but they have different origins. Acupuncture is based on Chinese medicine, where needles are inserted into acupuncture points along body system meridians to treat a variety of conditions. IMS is based on Western Medicine and treats at the source of the pain, that being into the muscle belly of the shortened muscle, and its corresponding spinal segment. What is neuropathic pain like? When the thin needle first enters the muscle it is nearly painless, but you will feel a cramp-like sensation as the muscle grasps the needle. The cramp can be quite painful depending on the severity of the muscle shortening. but it will ease. Treatment with IMS is usually done once a week, but may be once every 2 weeks. This depends on how severe your pain is, how you are progressing with treatment, and how long you’ve been having pain. There are risks associated with IMS, as with any needling technique. There is a chance of infection. However the needles used are sterile, individually wrapped needles that are discarded after each use, and alcohol is used to clean the area treated. A small bruise can develop where the needle is inserted if a small artery or vein is hit when entering the skin.To avoid lung puncture or collapse, or internal bleeding, IMS is never performed over major organs such as the lungs, or kidneys. It is possible to be sore for a few days after treatment, followed by decrease in pain, and greater flexibility. Fortunately, all the risks are rare and absolute care is taken to avoid occurrences. Treatment can be quite successful if used appropriately. This is again depending on the severity and duration of the condition, general health and how quickly your body can heal. Better outcomes can be achieved if you perform the home stretching exercises given by your physiotherapist, on a daily basis.